As an alternative, you can use third-party business activity monitoring products with InterSystems IRIS™. These products can interoperate with InterSystems IRIS via any of its connectivity technologies, including web services, JDBC, ODBC, and more. A business metric is a specialized business service class that you include in a production. While the production is running, the business metric values are available for display; when it is not running, the values are null. The values in a business metric are called properties. There are two general kinds of business metric properties: simple properties and multidimensional properties with autohistory. As a developer of business metric classes, you are free to provide values for metric properties in any manner you choose: such values can be based on data stored within production messages or business process instances, data maintained within InterSystems IRIS by business processes, or data obtained by sending requests to external applications or databases. Also, there are two general kinds of business metrics: single-instance and multi-instance business metrics. A single-instance business metric holds a single set of metric values. The examples in the previous section showed single-instance business metrics. A multi-instance business metric can also have multidimensional properties with autohistory. In practice, however, it is not possible to simultaneously display the instances and the history. If you define such a business metric, then when you add it to the dashboard, the dashboard displays the current values for all instances by default. You can include a filter so that the user can select a single instance; in that case, the dashboard can display the history for that instance. All business metric classes are derived from the class Ens.BusinessMetric, which is itself derived from the Ens.BusinessService class so that it has the full functionality of a business service. For example, you can add a business metric to a production definition, you can assign a logical name to a business metric, you can schedule it for periodic execution (to recalculate its metric properties at a given interval), and you can invoke business operations and business processes as part of the metric value calculation. It must be a subclass of Ens.BusinessMetric. For this class, the ADAPTER parameter is Ens.InboundAdapter, which provides the CallInterval setting. This ensures that the business metric is invoked periodically. It must define one or more business metric properties. The details are different for simple properties and properties with autohistory. It can optionally specify values for property parameters, for example, to control the range of values. It must assign values to the business metric properties. To do so, it must implement the OnCalculateMetrics() method. The following subsections provide the details. Also see “Defining a Multi-instance Business Metric,” later in this chapter. This property can hold either numeric or string values. Generally, the purpose of this kind of property is to collect values at intervals, over time, so that the resulting series of numbers can be plotted on a chart. For this reason, the assigned values are typically numeric. The rate of collection is controlled by the Call Interval setting of the configured business metric. /// Total Sales for the current day. The following table lists the property parameters that you can use with Ens.DataType.Metric (in addition to AUTOHISTORY, which is discussed in the previous section). These parameters apply to metric properties that hold numeric values; none of them apply when the metric property holds a string value. LINK Optional. A URL specifying a browser page related to this metric. 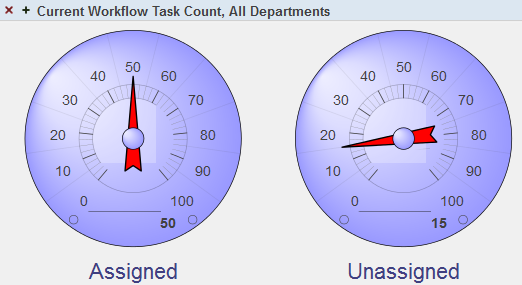 If a dashboard user right-clicks on the associated meter and selects the Drill Down option, the browser will show this page. RANGELOWER Optional. A numeric value specifying the expected lower range for values of this metric. This value provides a default for the low range of any meters connected to this metric. RANGEUPPER Optional. A numeric value specifying the expected upper range for values of this metric. This value provides a default for the upper range of any meters connected to this metric. THRESHOLDLOWER Optional. A numeric value specifying the expected lower threshold value for this metric. This value provides a default for the lower threshold of any meters connected to this metric. THRESHOLDUPPER Optional. A numeric value specifying the expected upper threshold value for this metric. This value provides a default for the upper threshold of any meters connected to this metric. UNITS Optional. A user-defined string enclosed in double quotes that specifies the units for this metric. Examples include "$US" or "Liters". This string appears in the bottom half of the dashboard display when the viewer clicks on the corresponding meter in the top half of the display. This section describes how to assign values to business metric properties for single-instance business metrics; the details for multi-instance business metrics are discussed later in this chapter. To assign values to business metric properties, implement the OnCalculateMetrics() instance method of the business metric class. The purpose of OnCalculateMetrics() is to calculate, look up, or otherwise set a value for any metric properties in the class. /// Number of times these metrics have been calculated. Notice that you specify the value for a property in the same way for simple properties and for properties with autohistory. In this method, you can optionally invoke business operations and business processes. You can also invoke any APIs needed to compute the values. Never allow a property with autohistory to contain a null value. 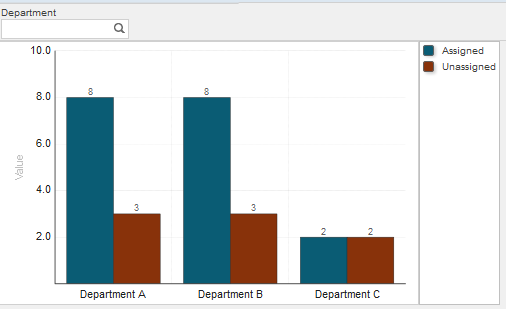 The null values are not displayed, causing bar charts and line charts to contain the wrong number of bars or entries. This can result in a mismatch between the axis labels and the items that they label. To prevent such problems, replace any null values with zero. Before the OnCalculateMetrics() method is called, all metric properties are set to their last calculated value (if any). After the OnCalculateMetrics() is called, the values of all the metric properties are stored in the business metric cache for subsequent use by dashboards or other interested parties (if any). Follow the instructions in the previous section, except that the details are slightly different for implementing OnCalculateMetrics(). Define a static set of instance names. To do so, implement the OnGetInstances() method to assign a fixed list of names to an array. This approach is useful if the set of instances is static. Define the instance names dynamically. To do so, add a MetricInstances() query to get a list of names from a column in an SQL database. This approach is useful if you expect the number or names of the items to change over time. In your implementation of OnCalculateMetrics(), check the value of the %Instance property and assign values to the business metric properties as appropriate for that instance. The instance names are strings. The instance names must be unique. The instance names may be displayed to users on a dashboard, so use names that are concise, informative, and appropriate. Try to keep the number of instances reasonable. Thousands of instances could be expensive to compute and difficult for users to understand. The query must be named MetricInstances(). It must take no arguments. The query must contain an SQL SELECT statement. The first column returned by the query returns the instance names. Check the value of the %Instance property. This property equals the name of one of the business metric instances. Set the values of the business metric properties as needed for that instance. This example uses the current instance name (%Instance) in an SQL query to retrieve the most recent sales data for that instance, then writes this data to the Sales property of the current instance of the class. You can also use the %Instance property elsewhere in the class when you want to substitute the current instance name. This section describes other options within business metric classes. 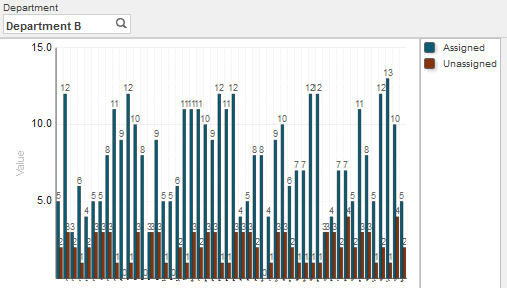 A business metric class can define actions, which you can expose as user options in dashboards. An action can perform a combination of client-side activities (such as filtering and refreshing the dashboard) and server-side activities (such as invoking your own APIs). The action mechanism is quite general. 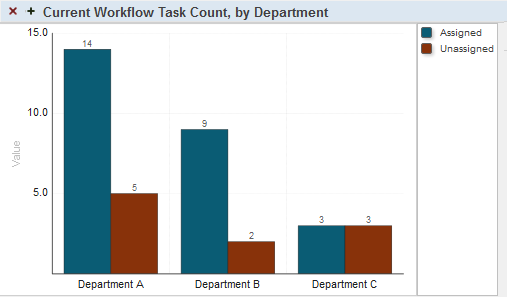 To define actions, implement the %OnGetActionList() and %OnDashboardAction() methods of the business metric class. For information on these methods, see the chapter “Defining Custom Actions” in Implementing InterSystems Business Intelligence. Add them to the appropriate production, in the same way that you would add any other business service. Configure the Call Interval setting as needed for each business metric. 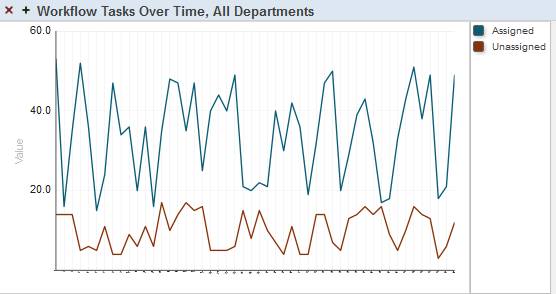 Create dashboards and add business metrics to them. For information, see Configuring Productions. Optionally extend the Production Monitor page to show information from your business metrics. See the next section. ^Ens.Monitor.Settings("MetricClasses",n,"Metric") Configuration name of the business metric, for the nth business metric. The Production Monitor page lists the business metrics in the order specified by n.
^Ens.Monitor.Settings("MetricClasses",n,"Instance") Instance name of this business metric. If the metric does not have instances, omit this. If the metric does have instances and you omit this, InterSystems IRIS uses the first instance, considering the order in which instances are defined. Set ^Ens.Monitor.Settings("MetricClasses",1,"Title") = "Title for Display"
For each business metric that you add, the Production Monitor page indicates when it last updated the metric information, if there is any data for the given metric or instance, and whether or not the given metric is currently running. For information on using the Production Monitor page, see “Monitoring a Production” in Monitoring Productions. In some cases, you might need programmatic access to metric properties. For example, you might want a business process to directly read or set a metric property. To do this, use the GetMetric() and SetMetric() class methods of Ens.BusinessMetric. Where metric is the name of the business metric (the configuration name, not the class name) and property is the name of the metric property. If GetMetric() is unable to read the specified value, it returns an empty string. Where metric is the name of the business metric (the configuration name, not the class name), property is the name of the metric property, and value is the value to which the metric property should be set. SetMetric() returns a %Status code indicating success or failure. It is possible that SetMetric() is unable to acquire a lock for the business metric and may fail for that reason. BusinessMetric is the configured name of the business metric class. Instance is an instance number. Instances are numbered in the order in which they are defined. Property is the name of the business metric property.